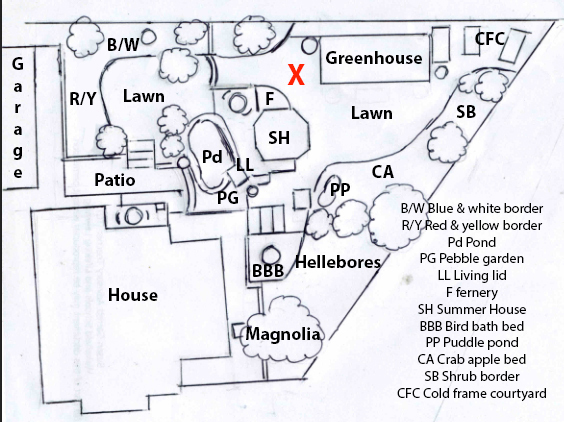 Here's the sketch plan again so you can place the area that I am describing into the context of the whole garden. Our starting point is indicated by the red cross. 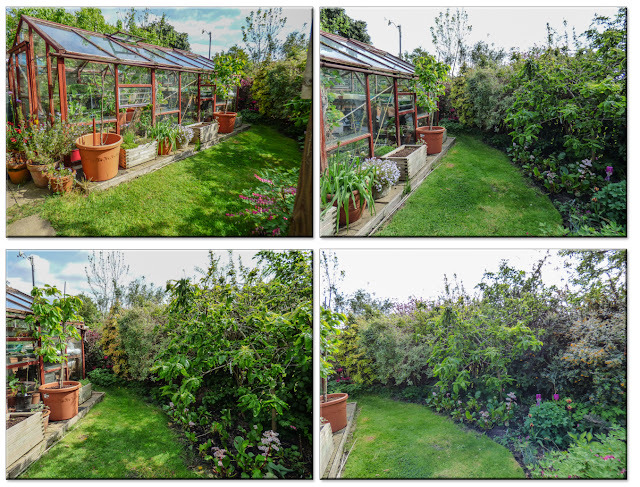 We are now looking between the greenhouse on the left and the summerhouse on the right. Follow me through the gap between the greenhouse and the summerhouse. Now as we stand with our back to the summerhouse this is the view. The large terracotta coloured tubs contain an apple that is very slow to start into growth and a cherry. Other tubs contain herbs, alliums or are waiting to be planted up. On the left is a perennial bed under a John Downie crab apple. If you look very closely you may just spot a bird table nestling amongst the shrubbery. 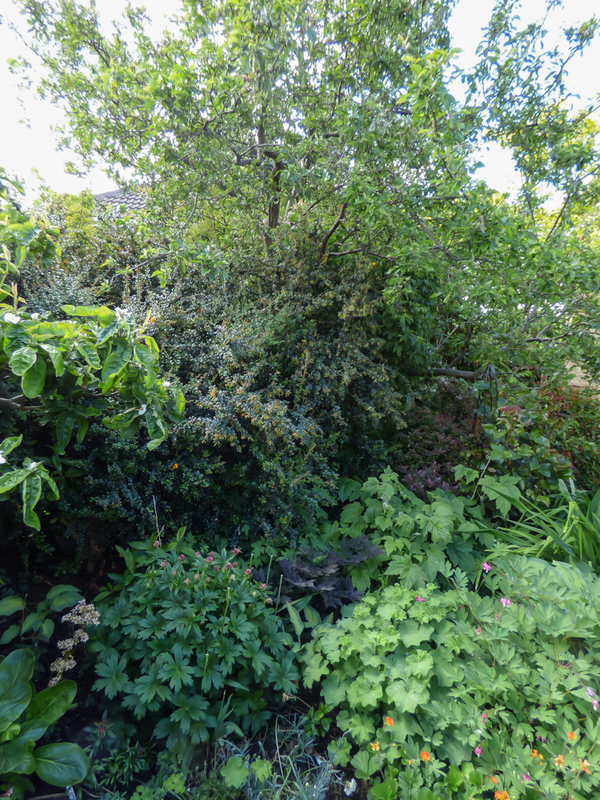 The perennial border will soon be in line for a bit of a makeover as some plants over dominate and elsewhere there are gaps. 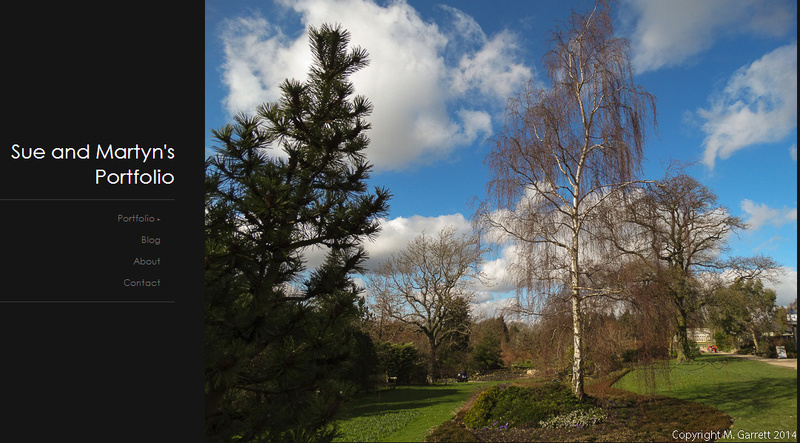 Now with our backs to the shrub border we look towards the summerhouse. 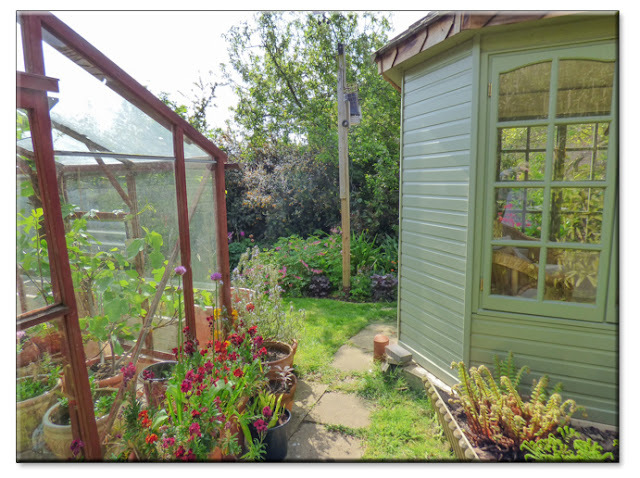 If we turn to our right and take a peep behind the greenhouse we can take a quick look at what we call the cold frame courtyard. We won't linger here as this area is in the middle of a makeover A new section of fencing has been erected and a cover made for the WoodBlocx raised bed. Turning back and walking towards the summerhouse, on the left of the summerhouse is one of our bird table and feeding station. 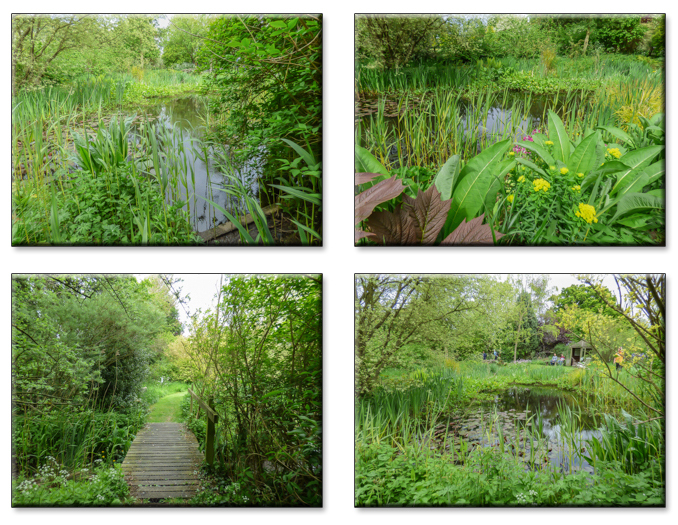 As we walk between the border and summerhouse the puddle pond is on the left. 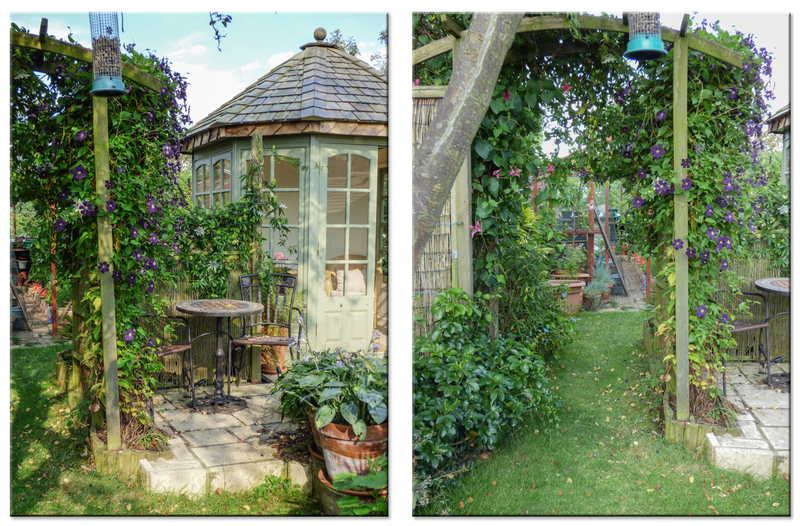 Now standing alongside the summerhouse looking back up the garden, we can look to the right at the bird bath bed. 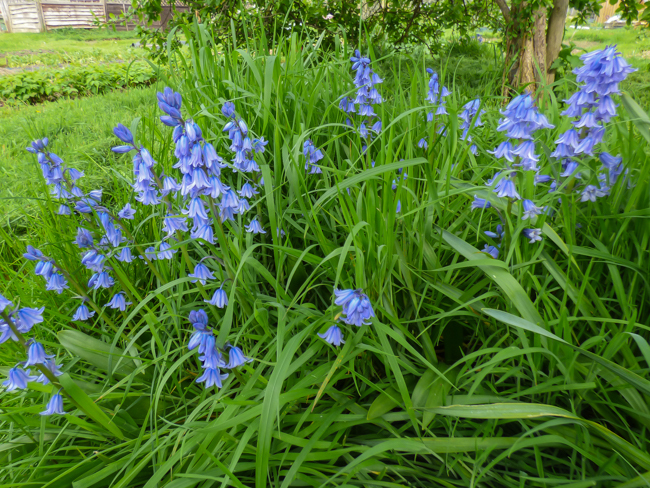 This bed is at its best in spring when the bulbs are flowering. At the moment it is sporting the remains of daffodil leaves which will soon be tidied. 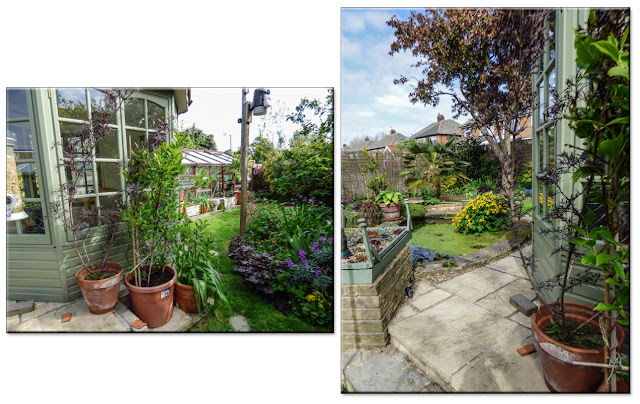 The photo on the left was taken earlier in the year. 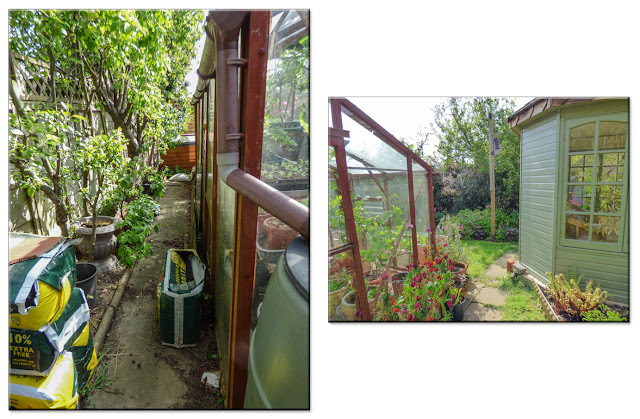 Looking to the left is the summerhouse outside of which are tubs containing sambucus nigra, kiwi Issai and some alliums. 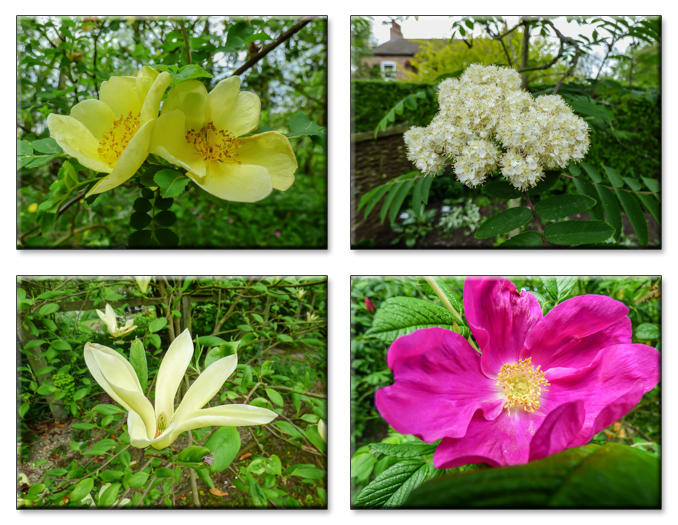 Since taking the photos the sambucus has been planted up in the cold frame 'courtyard'. 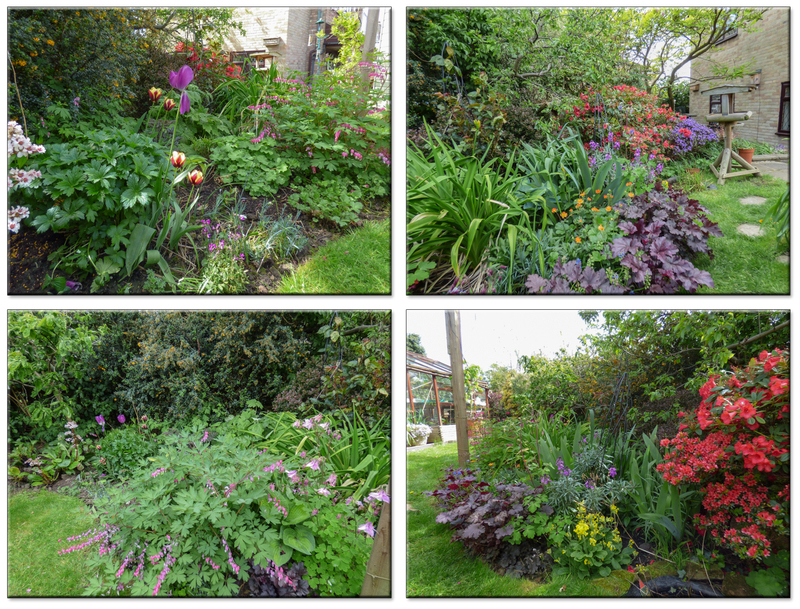 I've mentioned in previous posts that I am planting up a bed with red and yellow perennials. This is half planted but I needed more plants to fill the area and was on the lookout for astrantia Ruby Wedding - coincidentally it is our Ruby Wedding anniversary this year but that wasn't why I was looking for it. I had tried local garden centres with no luck but found plenty of sources online. 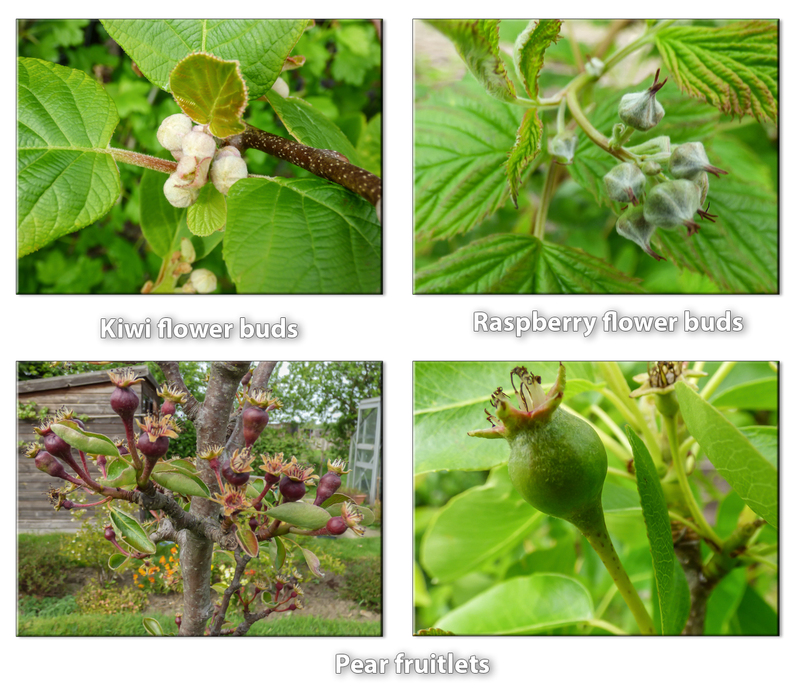 Rather than order online I decided to check the plant list for Stillingfleet Lodge Gardens Nursery. Most of the plants already housed in the border were bought here during an earlier visit last September. After checking that the searched for plant was in stock and deciding that the listed astrantia Ruby Star also sounded a good option we set off on Friday - the garden is only open Wednesday and Friday afternoons -intending to combine a visit to the gardens with a spot of plant acquisition. 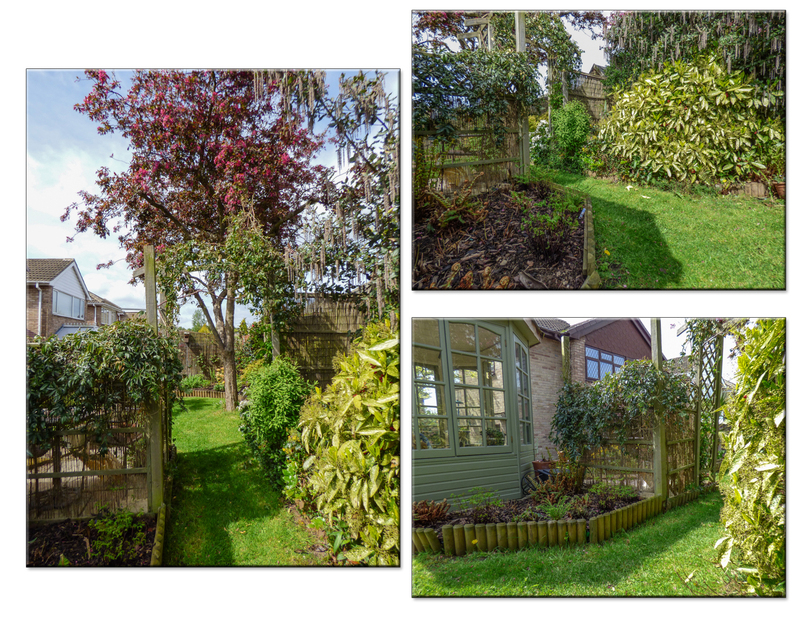 The garden is a privater garden and the parking area more resembles a well tended lawn than a car park. Here we left the car in the protection of a few watchful guinea fowl. 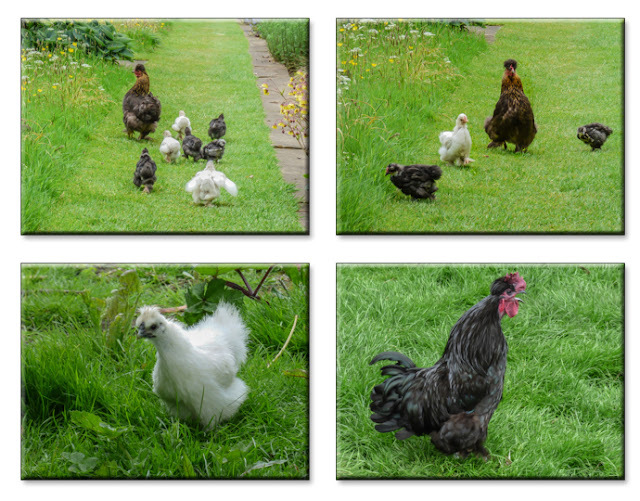 Before we visited the nursery we paid a visit to the garden. 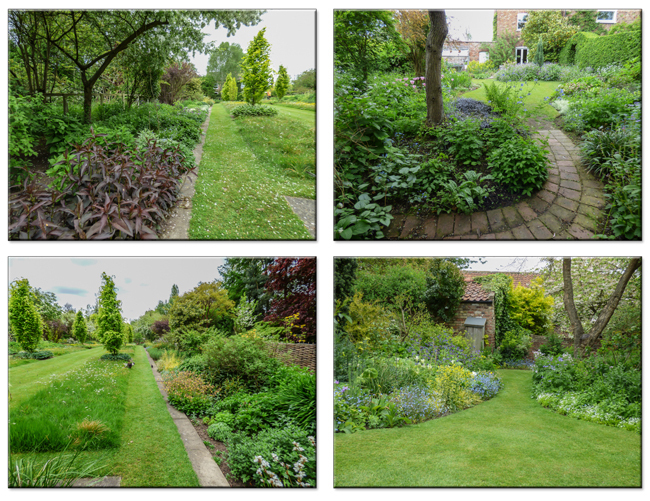 The gardens area flow from the more traditional lawns, perennial borders and courtyards near the house which transition into more wildlife oriented areas as you walk away from the house. 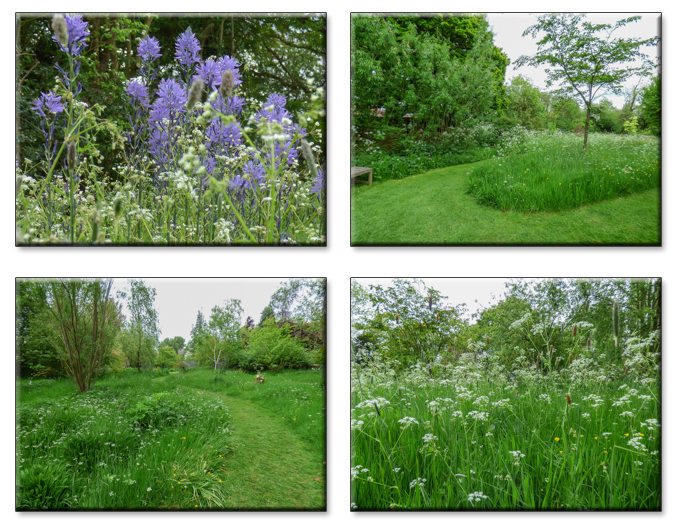 I especially like the way that wild flower patches were growing in the middle of an otherwise fairly formal lawn. Human visitors were not the only ones strolling around the gardens. 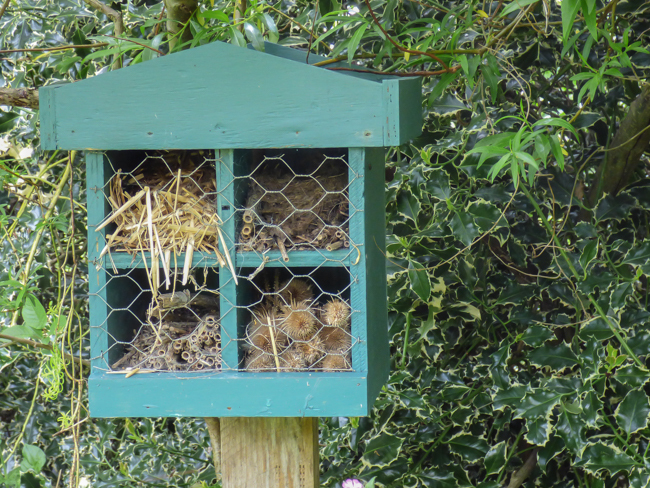 I liked the idea of this small bug hotel - It's something that I may copy at some date. ... and a wild flower meadow. Some plants caught our eye as we wandered around. I particularly liked the creamy, yellow magnolia but that wasn't something that would be on offer in the perennial nursery. 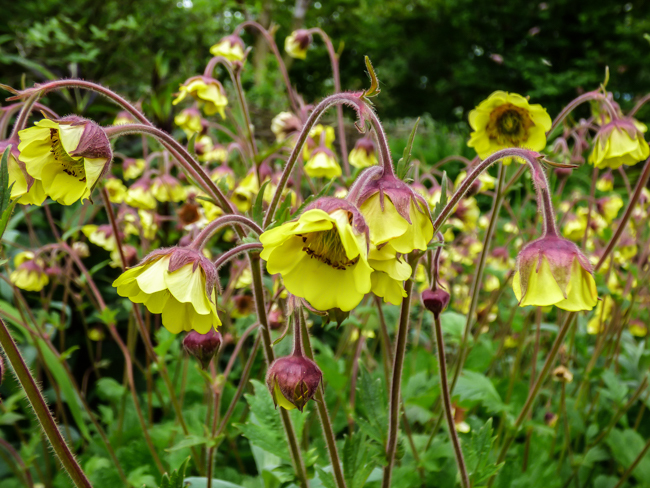 We also had our attention drawn by this plant - Geum Herterton Primrose. Just the sort of plant for a red and yellow border. After a drink and a piece of cake or in my case flapjack we headed for the nursery which is where our intended two purchases became eight. Mango Popsicle was the only small growing kniphofia available and I am in two minds whether the orangish colour will be in keeping with the colour scheme but if not I can find it a home elsewhere. I'd really like a small growing red or yellow kniphofia but not one that is both red and yellow. I also was looking for helenium Ruby Thuesday (Tuesday) but these were sold out so I am hoping Chelsey will fit the bill. 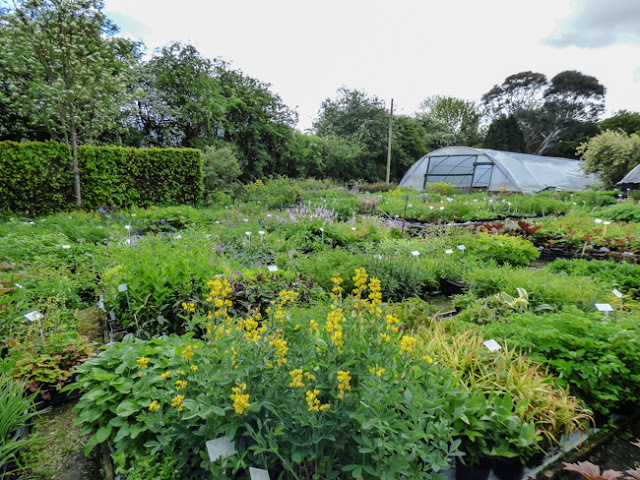 Just a word of warning if you do visit Stillingfleet Lodge you will need to take your cheque book as they don't accept credit cards and there is no way you would be able to resist coming away with armfuls of plants. If you'd like to see more photos of the garden click here for a selection of the many photos we took including larger versions of the ones above. 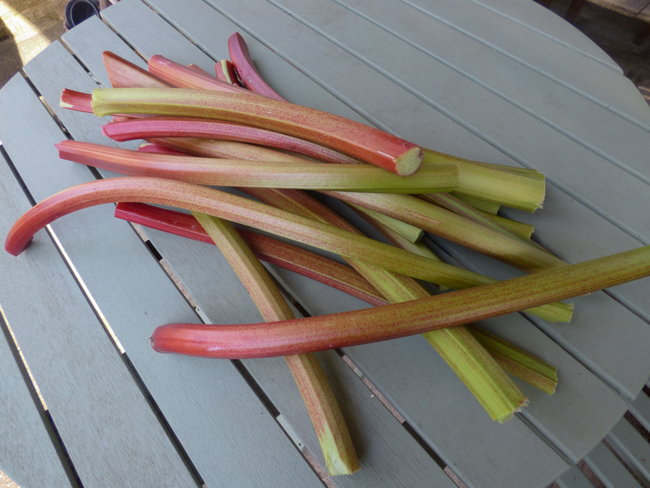 At first I thought that I couldn't possibly bore you by writing about rhubarb again. 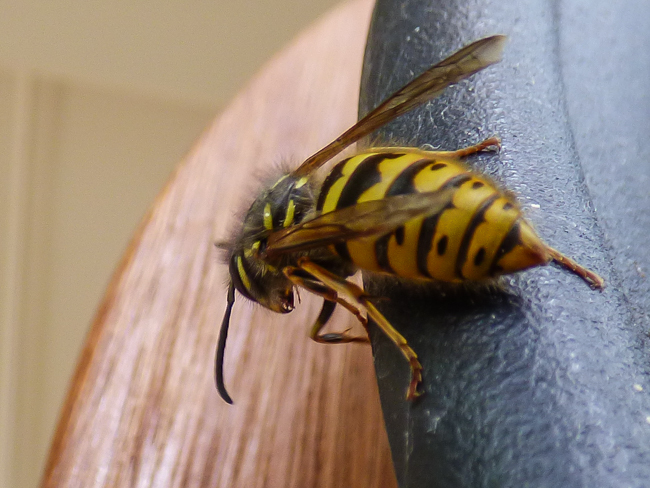 Then I reconsidered as we aren't harvesting much else at the moment and you can always kill the page. 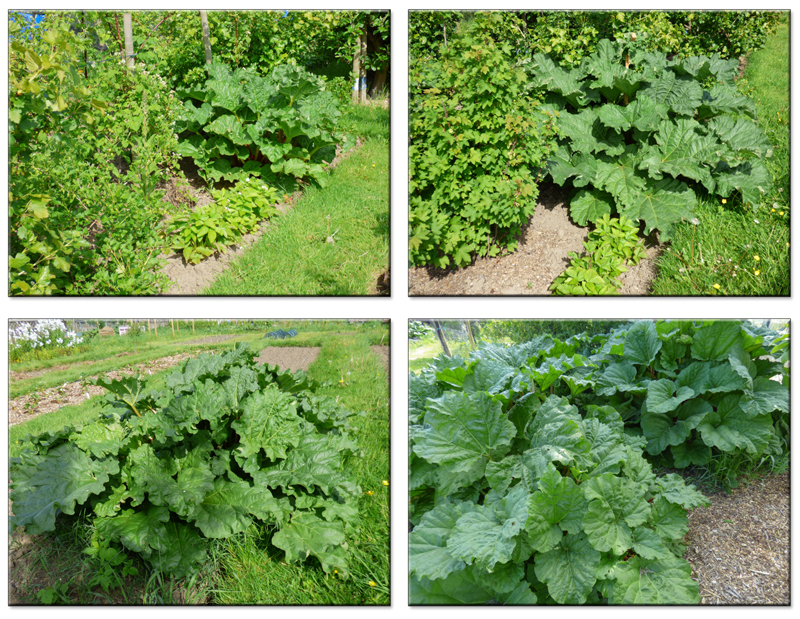 So at the risk of becoming boring here is our latest rhubarb harvest. It isn't all destined to be eaten this week, after all that would be asking for trouble, most will be stewed and frozen. For those of you that have read previous posts - can you guess which variety this is? 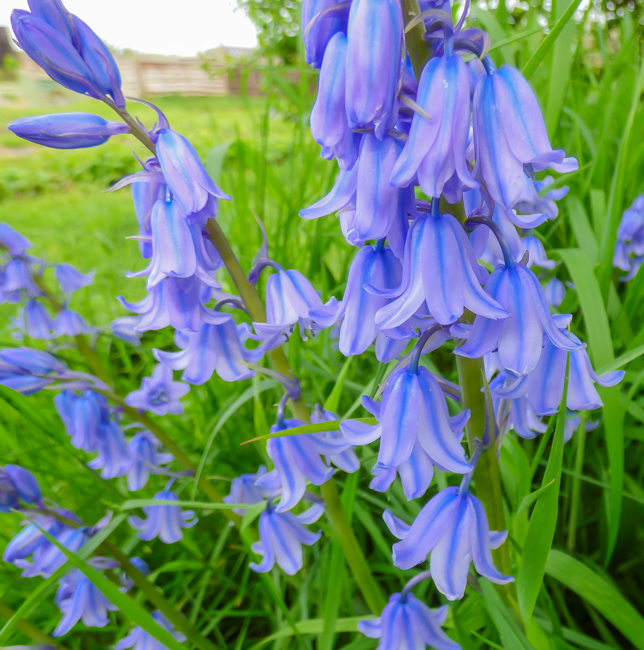 A clue is that it is a variety that we have picked earlier. If you look closely at the photo above on the right you may be able to tell that the two varieties of rhubarb have different leaf shapes. Here's a closer look. On the right Grooveless Crimson has smoother edged leaves which are narrower than Timperley Early on the left. Our other main harvest was purely decorative. 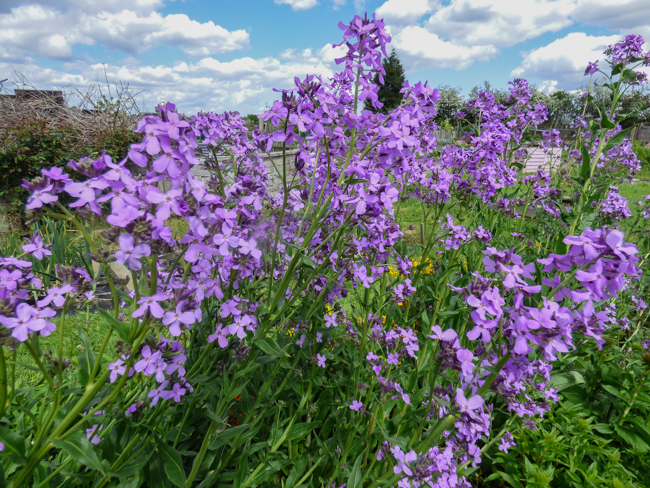 Last year we grew Sweet Rocket for the first time. It was a purple variety. This year I thought I'd like a mix of colours so bought a mixed packet and ended up with this. The photo is a bit deceptive as the flowers are mostly white. Maybe I need to buy a packet of each colour next year. 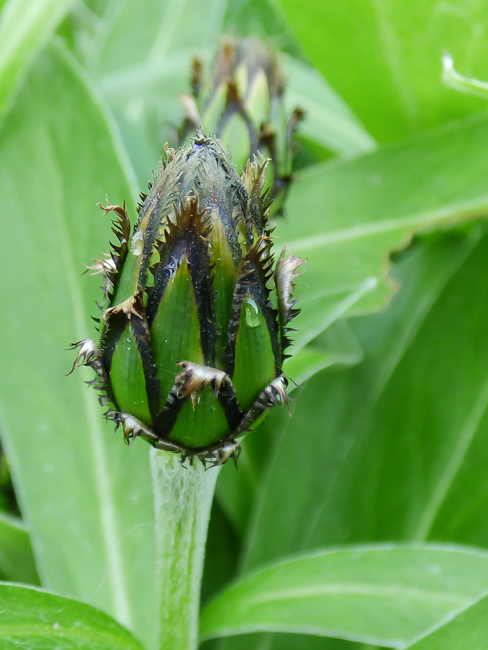 Does anyone know how long the seed stays viable and whether seed collected from the flowers comes true to the colour of the parent plant? The flowers don't last long when cut - although maybe I should cut them when the flowers are mostly in bud - but their perfume can rival most other cut flowers. It seems at its most intense in the evening. 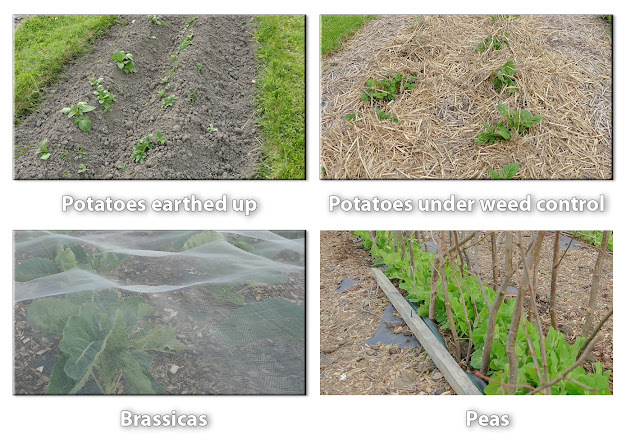 We do enjoy home grown peas whether raw in a salad or cooked. We also like to freeze them for use later in the year. The problem is that we never seem to get enough so this year we are devoting more space to them. 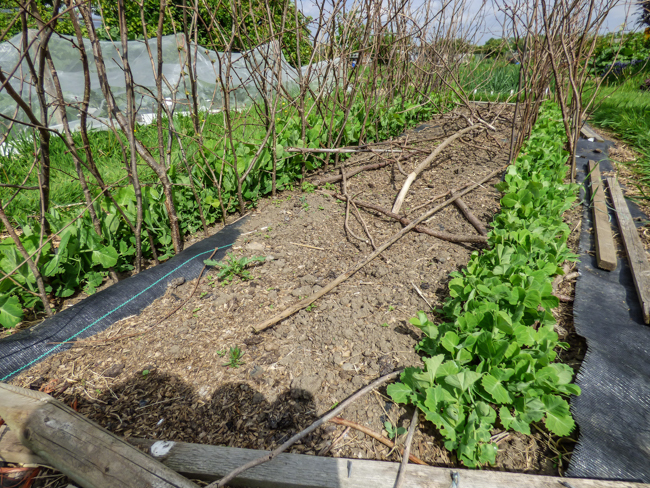 We are growing climbing French beans that will take less ground space and cutting down on the number of runner bean plants so this free space will be given to peas. 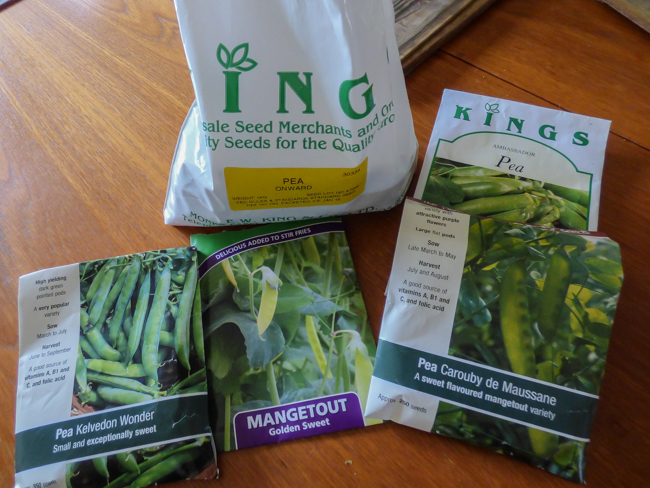 We are sowing two types of mangetout - Carouby de Maussane and Golden Sweet - and three of 'normal' peas - Onward, Kelvedon Wonder and Ambassador. Note the super large pack of Onward seeds which will hopefully produce our main crop and also a supply of pea shoots. 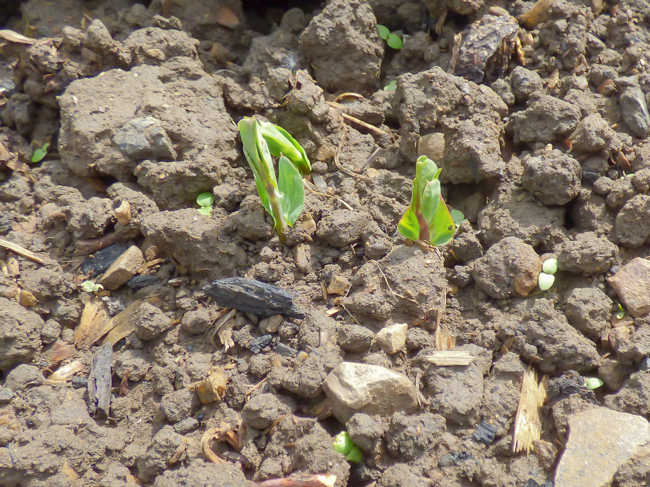 We don't direct sow many things on the plot but we have found that directly sown peas seem to grow far stronger and produce a better crop for us. 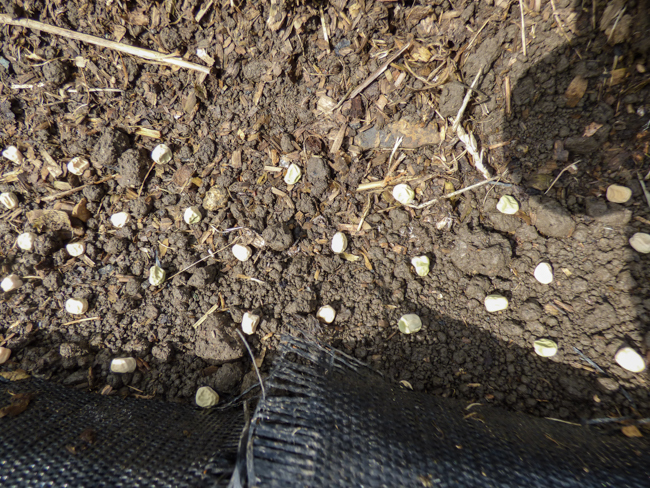 It won't surprise regular readers that we grow the peas through a trench cut into weed control fabric. 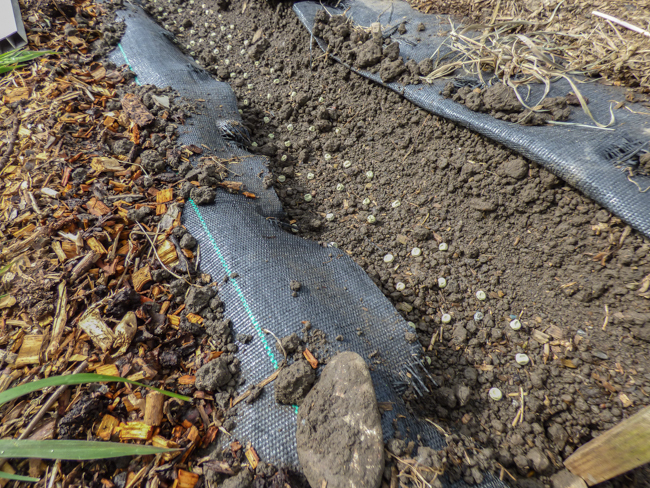 We sow a generous amount of seed to try and compensate for any losses to wildlife or non-germination. Yesterday I sowed a first batch of Golden Sweet which should have yellow pods, Ambassador and Kelvedon Wonder and a third batch of Onward. Two rows of Onward have already germinated and are growing well. 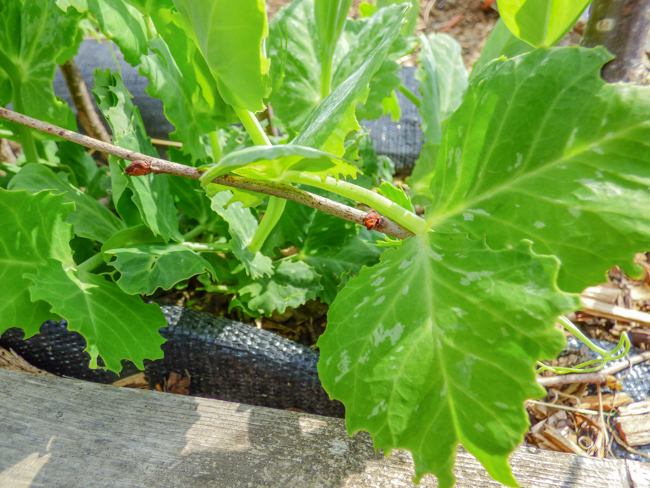 They haven't escaped the attentions of the pea and bean weevils as the leaves have the tell-tale notches. Fortunately this doesn't seem to impede their growth or their cropping potential. 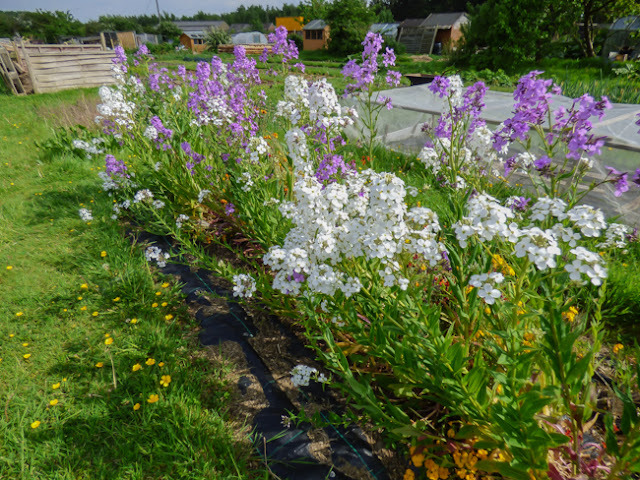 The row of earlier sown Carouby de Maussane are just pushing through the soil. 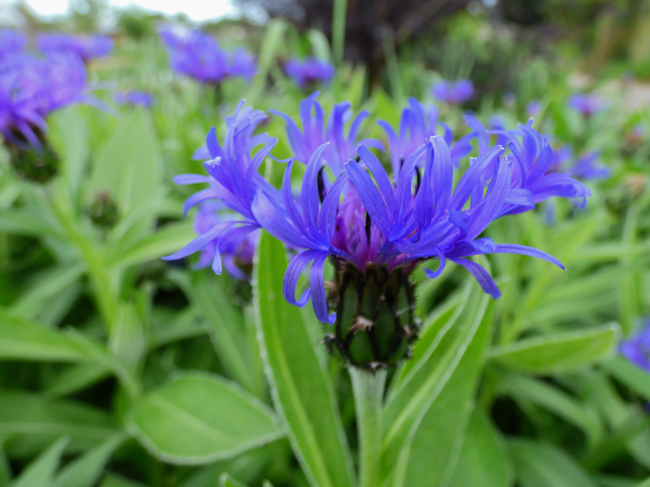 These mangetout have attractive purple flowers. Interestingly for the first time this year I noticed that mangetout seeds are a different colour to normal pea seed. They are a purplish- brown as opposed to green. Initially the newly emergent shoots are given a little protection from pigeons using some hazel twiglets. 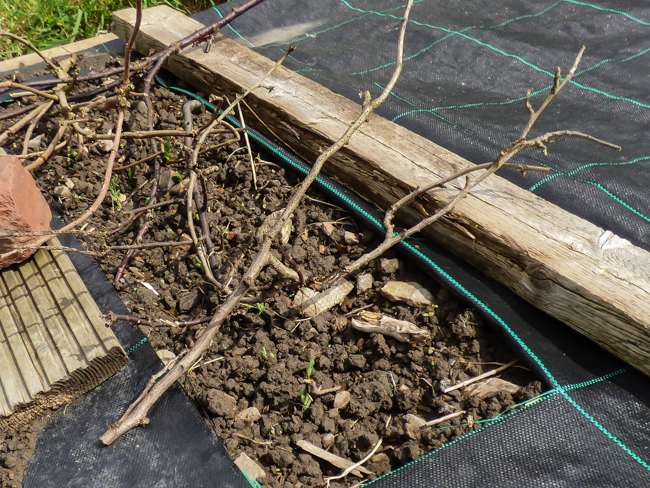 Later hazel poles will be used to support the mangetout and short twigs will support the other peas. We are hoping - well we can hope - for a good pea crop but for now we will have to content ourselves with the peas shoot being harvested from the greenhouse. Let's take a second visit to our garden.. Here's the sketch plan again so you can place the area I am describing into the context of the whole garden. Our starting point is indicated by the red cross. 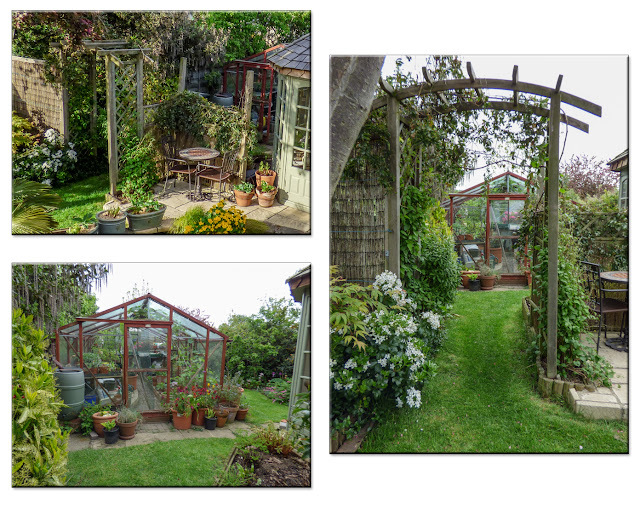 An archway leads from the garden area described in my last post to the area just outside of the greenhouse. During summer the arch and adjoining screen is clothed by a very vigorous passion flower and a couple of clematis. Once through the arch you are in a small enclosed area. 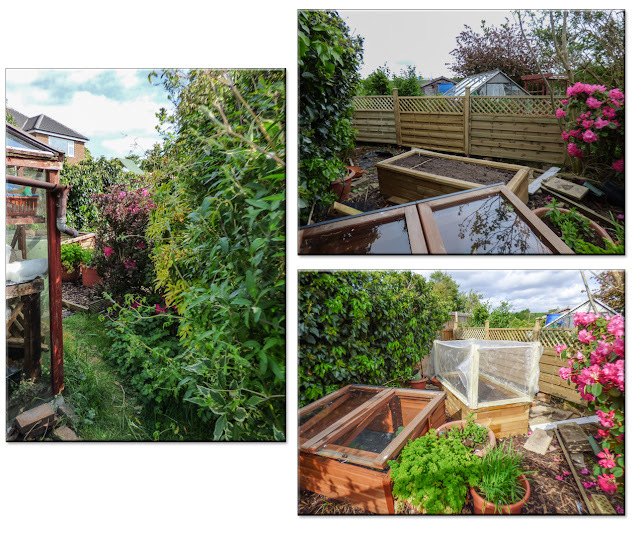 The views shown above are taken with my back to the greenhouse, On the left is the small fernery which at the moment is just unfurling and on the right is a bed ion which is planted an aucuba and a garrya. 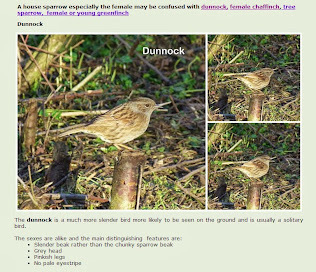 The photos below were taken last summer in the case of the fernery and the garrya earlier this year. Just before we leave this part of the garden I'll let you have a peep behind the greenhouse where bags of compost are stored. The trees that you can see were initially a pear and apples grown as cordons but they had other ideas. Just before you go on the right is a quick peep into the area I'll be showing you on your next visit to our garden. 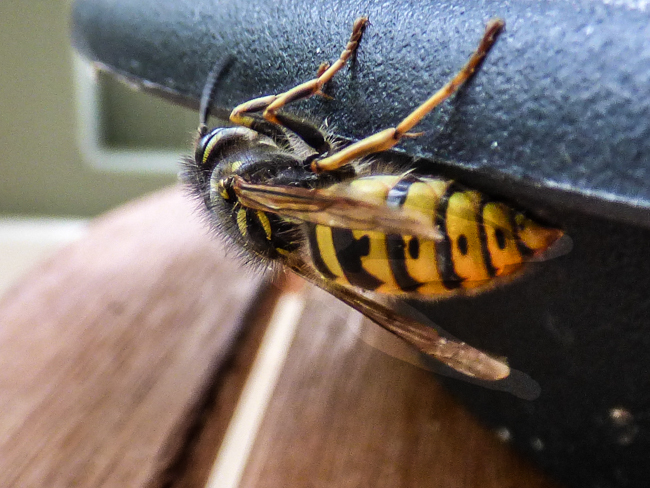 So that's it for part two of your garden visit. Again Martyn and I have both posted a video of our plot. Some things have grown since our last tour but some things have struggled to thrive mainly due to the constant battering from strong winds and the lack of any sustained spring warmth. 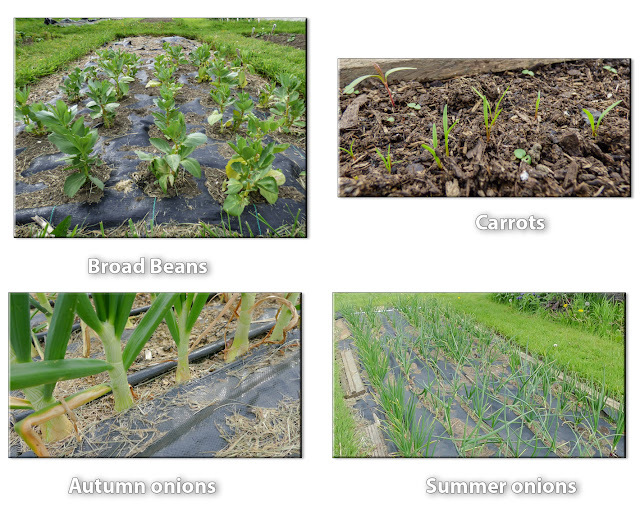 There are still plenty of empty beds to be filled so we really do need some good weather so we can get on with things. 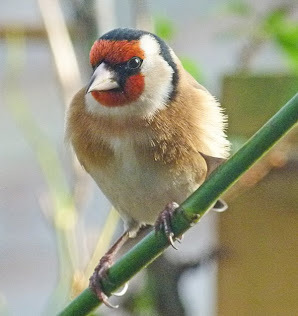 The video is about 12½ minutes long and again is complete with us wittering so if you prefer short sweet visits I've added some photos so hopefully everyone will be happy.